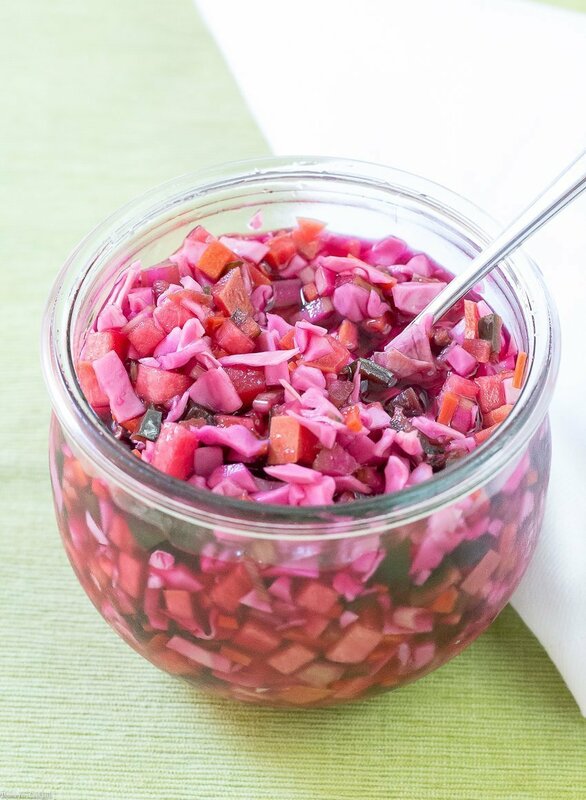 This Pickled Peach Coleslaw is a sweet and tangy mixture of pickled seasonal veggies. Red cabbage, peaches and poblano peppers in a tart brine made from cider vinegar and peach preserves. For the last few weeks I have been cutting back on market trips until my chest heals up a bit more. I tried to stick with my normal work schedule after the accident but it was too much. Especially with the kid leaving. I need my downtime. [bctt tweet=”Pickled Peach Coleslaw #pickled #seasonal #veggies” username=”thyme4cocktails”] And once I got over my guilt about only going every other weekend, it dawned on me that I wasn’t rushing to use up produce come the weekend. One trip was lasting us almost 2 weeks. It made me pause and really look at who was eating what lately. And it dawned on me that the transition was already happening and I’d missed it. The kid has barely been here this summer. Between work and friends, he has been living is own life and spending less time at home. Which also means eating here less. I am cooking for 2 now instead of a small army. And it’s a whole new ballgame. Leftovers are no longer gone overnight, instead they are getting pitched in the trash after 3 days and excess produce is sadly wilting away in the crisper drawer. Not to mention more meals out for Paul and I because it seems like a lot of effort to cook every night just for the 2 of us. That will change now that I am aware of it. Once I wrap my brain around the whole empty-nest concept. 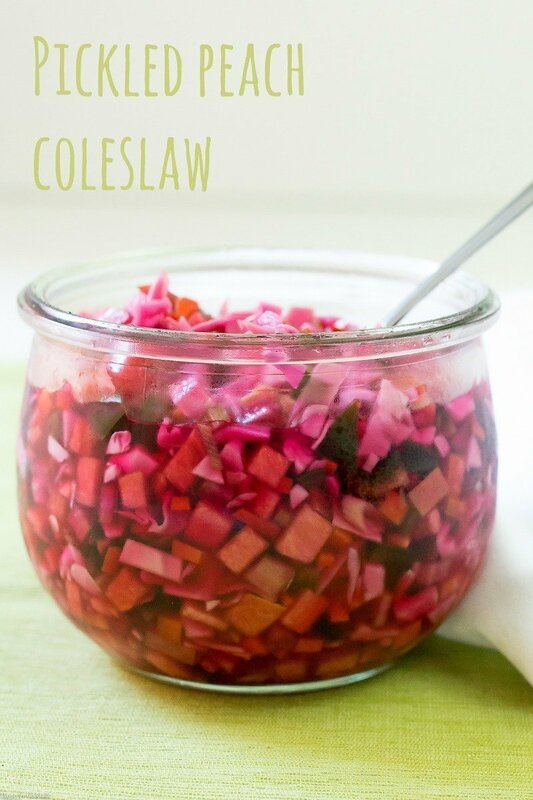 But until then I am rescuing produce with this Pickled Peach Coleslaw recipe. Pickling is a great way to preserve or extend the shelf life of produce that is on the verge of giving up. I recently created a Quick Pickling post for Discover~ A Blog by World Market with different tips and techniques. 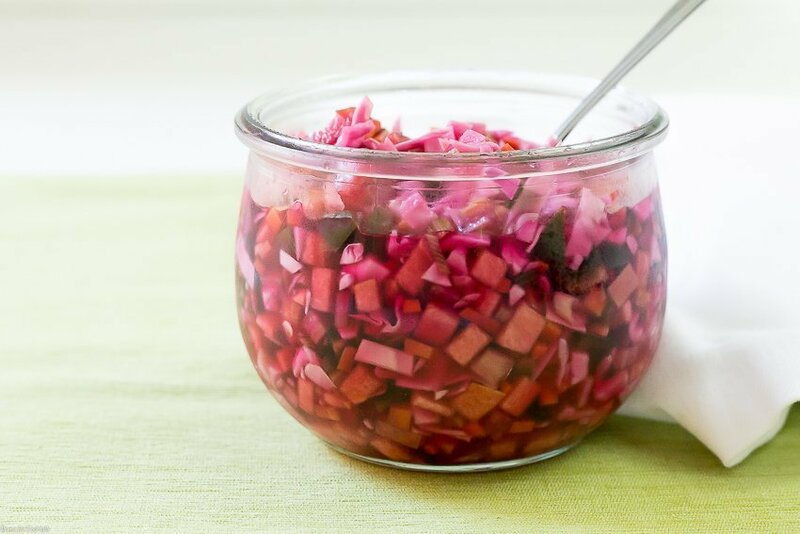 This Pickled Peach Coleslaw is a sweet and tangy mixture of fresh seasonal veggies. Red cabbage, peaches, poblano peppers and in a tart brine made from cider vinegar and peach preserves. Add cider vinegar, peach preserves and peppercorns to a medium sauce pan, stirring until preserves dissolve. Bring to a low boil, reduce heat and simmer 10-15 minutes until slightly reduced. Let cool 10 minutes. Place remaining ingredients in a large lidded jar. Strain peppercorns from brine, pour over vegetables. Let chill 2-3 at least hours or overnight. Don’t worry about throwing away old leftovers… get a few worms and have a composter to feed…for your garden.